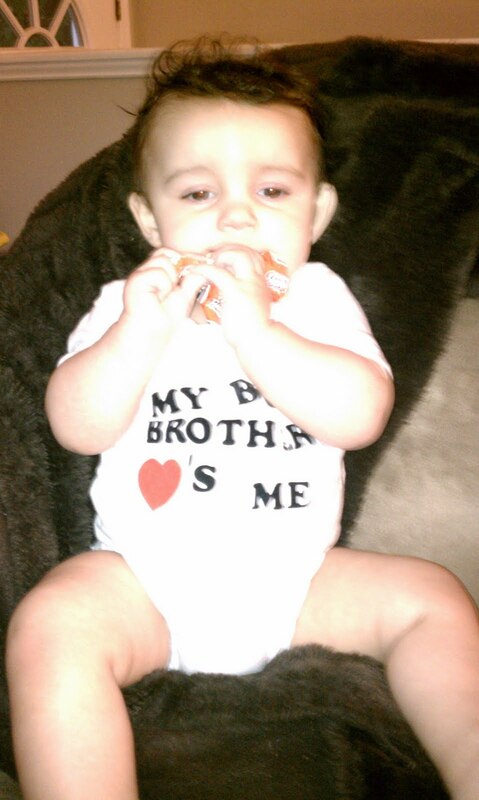 This shirt says My Big Brother Love's Me! It seems like someone is always having a baby or a baby is becoming a toddler or a toddler is now a "big boy" and so on. You see where I am going with this right? Our children are growing up and buying clothes for them can be so expensive. I know that I have a ton of clothes my 1st son hardly wore and now I see that my 2nd son is going through them very fast as well, most worn only a few times. My friends and I have come up with a Clothing Swap as a play date. Every 3 months we bring clothing that our children no longer fit in to swap with each other for clothes that do. You can bring clothes, shoes, hats and socks. You can Swap anything you want really, there are no "real" rules. It is just a fun way to change out our child's wardrobe without breaking the bank. We don't bring anything that may hold a special memory or something that we may want to save for any future child, but anything goes really. See the above shirt? We got that at a Swap and I just love it!! I love this idea! A friend has a gift swap in January. We all bring gifts we recieved for Christmas that weren't quite a hit. I always find something great! This is so great!! Thanks for stopping by Keeping Up With The Rheinlander's.